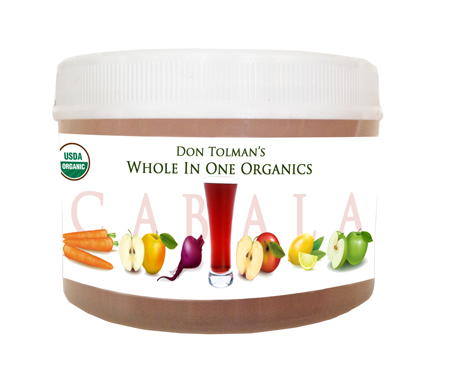 Welcome to Don Tolman’s Whole in One Organics and our Aquatic Nutrition, the Greatest Organic Living Fuels! It’s an Ancient drink mix that targets the health and functional capacities of your Vision, Heart, Brain and Skin. Order Cabala Juice 8 oz. here! The 8 oz. size will last approximately 1 week when mixed as directed on the packaging which is 2 tablespoons to an 8 oz. glass of water! Order Cabala Juice 32 oz. here! The 32 oz. size will last approximately 4 weeks when mixed as directed on the packaging which is 2 tablespoons to an 8 oz. glass of water! Light Infused Food Evaporation or (LIFE) is a genius breakthrough in plant, fruit and vegetable drying technology! Bio-photon frequencies are the colors in light that create evaporation through electromagnetic energy fields that water molecules are drawn too just like iron filings to a magnet. Total evaporation happens in just minutes or hours not days. There is no heat, nor freezing for days at a time like freeze dried foods where a lot of nutrition is lost in the process. In fact there is no loss of any nutrition, not even Vitamin C.
Every nutritional component is bio-activated when the powders are simply added to clean pure water. These are Natures game of (GOLF): Greatest Organic Living Fuels. There is a family in Oregon that has been Organic Garden, Grove and Vineyard caretakers for over 100 years. I met with them years ago when I was lecturing and supporting putting into place the Oregon Tilth Law of Organics and the 1991 California Act of Organics. This family has had a breakthrough in ‘Creative Inventive Genius’ that my Uncle Richard Tolman and his three best friends, Einstein, Tesla and Milo Farnsworth would be blown away by. They have created a ‘breakthrough genius’ technology of using ‘gentle light’ color frequencies to facilitate evaporation of organic fruits and vegetables. The entire process takes minutes, not days or weeks, unlike those that the sublimated freezing, then intense heat vacuum technologies use. This process of light saves over 88% in energy efficiency. Gentle color spectrums of light only target the ‘water molecules’ for evaporation in the raw, fresh, organic whole foods. This allows them to dry completely, with 100% bio-active nutrition left intact. This has never been done before! Even the foods Vitamin C is 100% active. In all other forms of food processing, the Vitamin C is lost and deactivated. The Flavors Are Left 100% Intact! The Colors Of The Foods Are Left 100% Intact! The Solid Encased Particles Of Crystalline Structure Are Left Intact! The 7 Known Fibers In Foods Are Left Intact! This honors nature’s sacred geometric patterns that atoms, molecules and cellular functions operate on, in the physics of matter. In this process the whole food particles are protected from oxygen and moisture deterioration, molds, bacteria and etc. 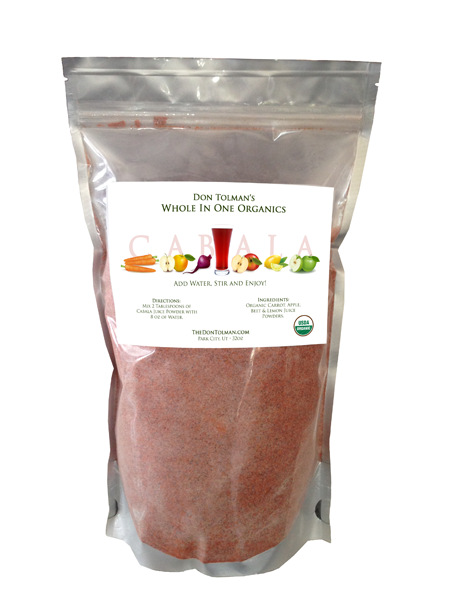 These organic ‘light evaporated’ whole food powders, have a shelf life of 3-5 years minimum, with no loss of any kind, not even nature’s colors or flavors. We are in an Age referred to by some, as the Age of Aquarius, which means “water bearer”. Talk about timing! Now we have a perfect way to have living nutritional components, in light weight powdered form, that we can bio-activate by simply mixing them in good clean water. I adore folks who support local farmers markets, then take the time to rinse, cut, juice and clean up. Drink C.A.B.A.L.A. juice every day! Order your CABALA Juice Today, Available in 8oz and 32oz sizes! Fantastic!! So when it says 8oz lasts a week, is that 1 glass a day? You are correct. Based upon 1 8oz glass per day, when mixed according to the directions, the 8oz size should last 1 week. Can this product be used as a juice fast? Yes, Cabala juice powder is great for a juice fast. Is there a time limit for which you could fast off this? Also, how much would I need to purchase for 1 weeks worth of fasting? Good question! It really depends on how many glasses you intend on drinking in a day. A jar is based upon (1) glass per day for 7 days. The large bag is based on (1) glass per day for (4 weeks). These numbers are approximates, as you may actually use more or less powder each time you make a glass. As far as a time limit, only you can be the judge of that. Let your body tell you when enough is enough. Try a week, if it goes well and your body seems to handle it just fine, then add 3 more days. Your body is the best at judging what you need and when you need it. buying it now! I can’t wait to try it!!! What a break through. Looking forward to receiving my shipment of the new Cabala juice powder in Australia. Will be fantastic for travelling, save taking the juicer around and having to find Organic food to make up the CABALA juice each morning. Thanks Team. Just wondering why I couldn’t find this product in the Don Tolman int wellbeing store. It basically a logistics issue. This product in manufactured in the U.S. and we would have to ship large quantities to make it cost effective, but things like to get hung up in customs. Therefore, this product is currently available at our store only! You may click on ‘Online Store’ link above to find all of our great products.